Ready to tackle whatever road conditions you might face? Combine race-proven spring technology with a set of perfectly tuned shocks and you have the Eibach ALL-TERRAIN-LIFT. 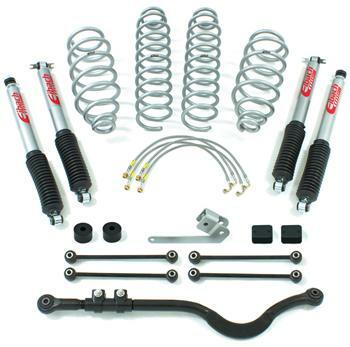 Engineered using the same industry-leading spring and shock technology found in SCORE, CORR, NASCAR and WRC racing, the ALL-TERRAIN-LIFT delivers maximum performance, as well as improved response and control over rugged terrain, all while maintaining Eibach’s classleading, street comfort characteristics. Depending on your trim level and options, the ALL-TERRAIN-LIFT can give up to 2-3.5” of lift. Sure, the Eibach ALL-TERRAIN-LIFT is designed to give thrill-seekers the best in off-road performance handling, but it’ll also make your Jeep look great as well. Get the proper off-road clearance that’ll make your ride stand out, and allow you to rock larger wheel and tire combos at the same time.